Many people consider washing windows one of the easiest households chores but it is not so. It requires some special tools and cleaning products. Especially if you want your windows to be cleaned perfectly and stay clean for a longer period of time. That is why we have created a perfect window cleaning service, so that we can help people get their windows in a top notch state. Our cleaners use special cleaning products, that are also ‘green’ and will keep your windows clean longer than usual. Get our window cleaning service because we are offering you the best one found in Canary Wharf E14. We are offering you to take this burden off your shoulders. 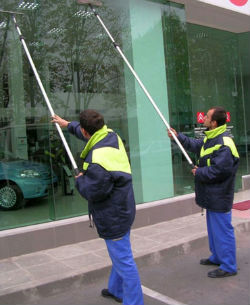 We know how boring and annoying cleaning windows can be, when you clean and clean but there is always streaks left. If you want your windows to be shining then you definitely need to call us. Our window cleaning service is impeccable and unequalled here in Canary Wharf. We guarantee you we are a certified and a reliable cleaning service provider and we always give 100% of us to provide our clients with the best window cleaning service. We too want your home to make a good impression on people and we know that shiny windows are a way to achieve that. Contact our friendly assistants now and ask about our various packages and prices. Find the best suitable for you and make an appointment with our amazing window cleaners. We are expecting your call because we want to help you with your window cleaning. We guarantee you will not need to look for another cleaning service provider once you have seen what our cleaners can do.